Grindstone race report / A view from the Back! There was an air of excitement during the pre-race briefing with many hopeful first timers and younger runners. I had returned from last year after leaving the race at Briery Branch Gap last year with fever and vomiting. I had been to every portion of the course several times for training and strategy formation. The weather was perfect. The race started with warm spirit on time. I was able to gather time until the ascent / rough terrain section up Little North Mountain where i power walked. I was able to gather time again until the steady ascent of Elliotts Knob. The goal was to move steady and not stop regardless of how small my steps got. After summitting Elliotts Knob, I was able to run through Dry Branch Gap. I then buckled down once again into a consistent ascent of the steep slope of Crawford Mountain. I was then able to run to the Dowell's Draft aid station. My crew was absent as they were last year. I did a quick change in the open before climbing at a good pace to the Lookout Mountain ridgeline. I was able to gather much time running from that point through North River Gap. I refueled and was able to power up the 7 mile section to Little Bald Knob. Once at this ridgeline i was able to race walk and run to the 1/2 way point. I picked up an experienced veteran pacer at this point. He was excellent at the ridge running and the descent to North River aid station. After refueling i picked up another experienced pacer with good climbing abilities for the Lookout Mountain, Crawford Mountain, and Elliotts Knob climbs ahead. I had gained a few hours on the trip out. The three climbs were somewhat slower than on the way out but remained steady. The descent from Elliotts Knob was slow and painful. Attention was centered on injury prevention. The final Little North Mountain ascent and descent was slow but steady. I managed to fall in the mud just before the spillway and the earth dam as predicted on my way out at the start. I paid constant attention to hydration, nutrition, and electrolyte management and was thrilled to finish in just over 35 hours. My wife and inspiration, a recent breast cancer surgery patient and ultimate tough survivor, was waiting with Clark at the finish. He recognized my accomplishment with a smile and her accomplishment with a warm welcome and hug. I competed only with myself and this wonderful course. I am reminded of the former wrestler Bobby Douglas who wrestled Dan Gable losing 9 times out of ten. He wrote a book about that one time he triumphed. I am sure that more times than not this course could beat the fight out of me, but not on this weekend due to some special magic. I have sincere respect for all who set out on this quest. For those who did not reach their goal for any of a multitude of reasons, I say "hold your heads high and come at it again next year". This experience has been a gift paid for on lay away over the last year with training and the support of the people I love. The view from the back of the pack proved to be pretty good. It was one heck of a wild ride that i would highly recommend. Godspeed to all on your trails ahead! Please support our photographer buy purchasing some photos! Thanks to everyone for participating in this years WebCast and Eco-X Sports event. 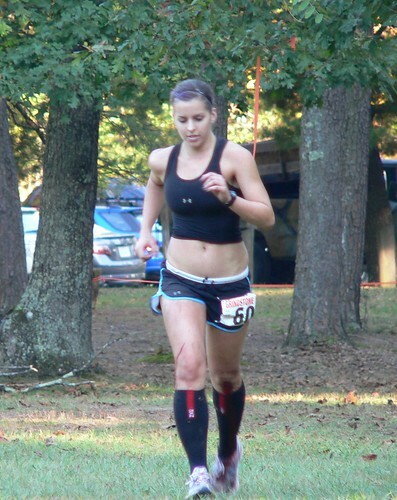 Please remember we have a lot of content that covered the event use it to remember your experience during the 2010 Grindstone 100 Miler Ultrarun. Congratulations again to all our finishers and participants. 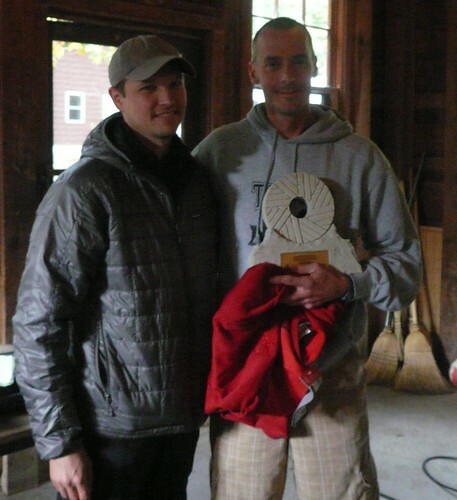 Special congratulations goes out to Sandi Nypaver and Brian Schmidt our 2010 Grindstone 100 Miler Champions. 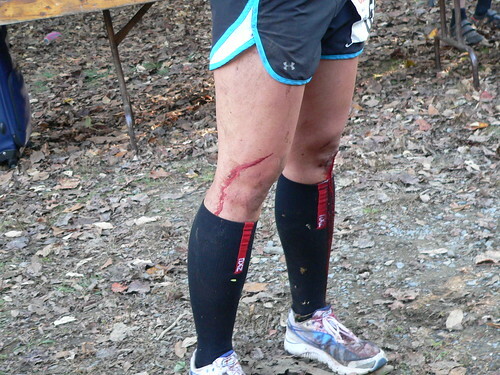 Sandi Nypaver not only landed top honors for female particpants in this years Grindstone 100 miler but she also drew best blood. 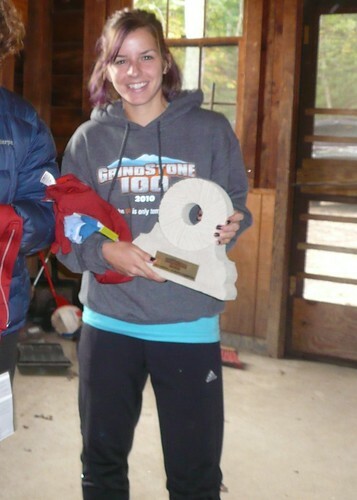 Congratulations to Sandi Nypaver on becoming the 3rd Annual Grindstone 100 Miler Women's Champion in a time of 23:05:08. Watch our 2010 Grindstone Ultra Winner finish. Chris Reed hugging the totem after a great race in his 3rd Grindstone 100 Miler. 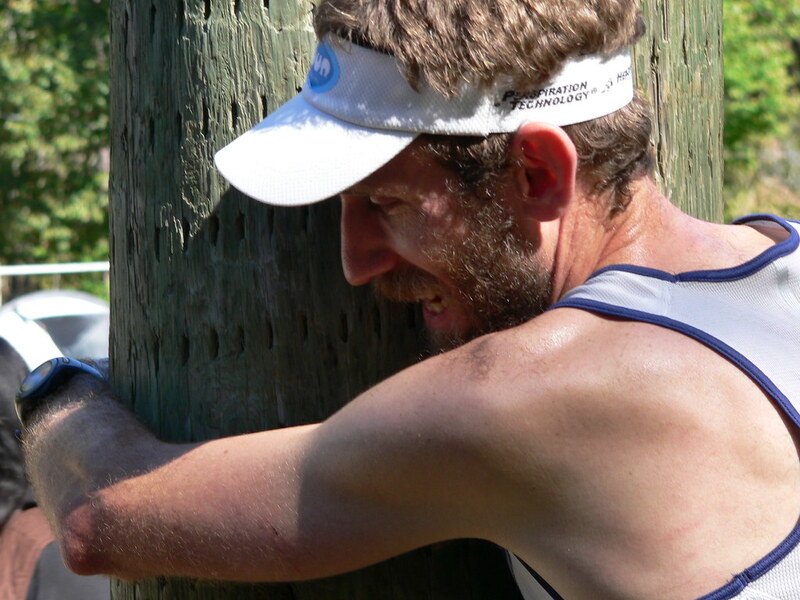 Hugging the totem is tradition at the Grindstone 100 Miler, Totem poles have traditionally recounted a story or to tell a meaningful event for a group of people. We use this same idea with the totem pole at Camp Shenandoah to symbolize the shared event among the racers and their amazing accomplishment. 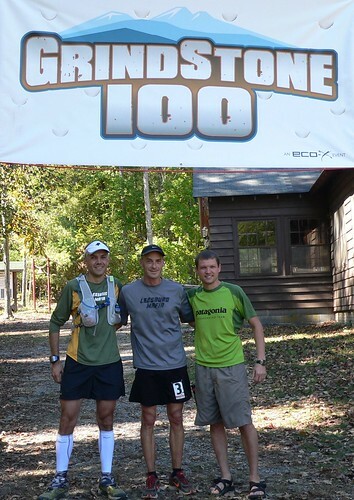 Congratulations to Brian Schmidt who won the 2010 Grindstone 100 miler in a time of 19:44:32, which is the 2nd fastest time over the 3 annual races. Click here to view Brian's eco-xsports ultra profile. Please go to our Eco-X Sports group page and like us, we are posting updates there. Also, let us know your comments!